Increased awareness of the effects of atmospheric pollution and ever-tightening legislation have challenged the precipitation industry to increase performance at economical costs and operation of the precipitators has to be maintained at optimum levels to prevent penalizing consequences to plant operators. The technique of electrostatic precipitation has undergone considerable development over the past decades and is now the method of choice for limiting particulate discharges. 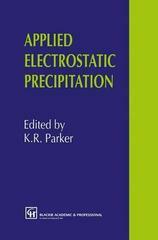 This volume is a good authoritative and practical guide for the industry specialist with contributions by leading experts in the field of electrostatic precipitation. Even the non-specialist will find this worthwhile as the basic theories of precipitation from both fluid and electrodynamic views are clearly presented.It also includes practical designs and gaseous and particulate features which impact precipitator performance. Future developments of precipitators are covered for the designer and developer. This mammoth compendium is a must have for the industry specialists to keep updated on the field. Model by Canadas et al. The programme ­ who writes the programme and when?